"Truth Be Told" / "Snafu"
Now this is more like it. With the set-up established, this season gets rolling with two distinct episodes that share common themes significant to Person Of Interest’s overarching story. The show treads familiar territory again but much more creatively than the premiere did. These episodes concern the way that the past informs who we are and comes back to haunt us. They also explore the difficulties of discerning goodness versus evil, who to trust and who to suspect. So much of life relies on being able to identify allies and avoid those with ill intent; because of the unpredictable nature of humanity, this is a more difficult code to solve than a series of letters and numbers. The scariest notion of all is that we ourselves are sometimes the hardest code to crack, and the results aren’t necessarily pretty when we get the answers. “Snafu” is one of the best types of Person Of Interest episodes, where the writers have fun playing with the show’s central conceit. This approach often results in a great blend of both humor and drama, and this episode is no different. Fortunately, the damage that the Machine has suffered has real consequences. This is fortunate because it means that the Season Four finale had real dramatic weight to it, but it’s also an unfortunate situation for the team itself. In a series of funny misadventures, it’s established that the Machine is no longer spitting out relevant numbers reliably. Worse yet, she’s having trouble recognizing her own team, which leads to chaos when she can no longer separate her friends from her foes. From the team’s point of view, it’s clear that something is wrong with the Machine, so its integrity and trustworthiness is under question. One of the team’s primary dilemmas is whether to keep the Machine’s system open or closed. Making this choice becomes even more complicated when the Machine has clearly changed; the nature of the very system under question is no longer clear. The Machine has lost the ability to understand the difference between the past and the present; past transgressions are judged without consideration of current intentions. The team consists of complicated misfits, to say the least so this is a problem. The Machine no longer trusts her own team; they are now a threat. At the same time, Finch himself is glitching. He keeps seeing Grace in the Machine’s surveillance footage, a reminder of his past that just won’t die. It’s part of the reason why he clings so desperately to his relationship with the Machine; he doesn’t want to be the cause of another failed relationship. Like usual, however, he’s willing to sacrifice the Machine if it ends up threatening one of his team members. This is exactly what happens when the Machine identifies Reese as a threat and sends a hitwoman after him. In an unexpected development, Root then demonstrates her loyalty to her teammates and trust in Finch specifically by knocking herself out so the Machine can’t manipulate her. Finch tries to reacquaint the Machine with reality by helping her forget every death she has suffered at his hands and reminding her of all of the good they’ve achieved together. “I’ll never hurt you again,” Finch insists to the Machine, making a promise that he probably won’t be able to keep. Finch’s explanation of the team’s mission and long rap sheet is that ethics can be murky but the value of helping people is clear. The ends justify the means. Finch reestablishes trust with the Machine and her system is opened. This decision could obviously lead to trouble, but Finch’s heart sometimes wins out over his head. Another issue is that an ex-con identified as a number is now being recruited by the police precinct; Samaritan has found its own allies in a newly corrupted police force. By working with the police, the ex-con is putting his trust in the wrong people in a reversal of the traditional roles. “Truth Be Told” is a more conventional number of the week, but it’s also a thematically rich exploration of Reese’s character. A series of flashbacks links the number of the week to Reese’s past with plenty of twists along the way. Reese’s current mission objective is to trail a new number, a security analyst named Duncan working for a consulting group that holds contracts with the Department of Defense. Simply put, Reese ending up doing penance for once eliminating a man at the behest of the CIA by saving his brother, Duncan, from Beale, Reese’s former boss at the CIA. Reese killed Paul because he was ordered to eliminate a traitor, and he identified Paul as one though an interrogation without any solid proof. Again, the show revisits the necessity of differentiating between good and evil, a useful skill for a member of Team Machine, but one that can come with a heavy price tag. Reese goes beyond saving Duncan physically, however, and tries to save him mentally as well by telling him a lie. He tells Duncan that his brother Paul died a hero. Reese knows what it’s like to carry painful memories and wants to spare Duncan that agony. Maybe if Reese rescues enough people, he can start to believe that he himself has changed; that he’s a good person. Reese makes for a great recruit for any mission because it’s all he has having grown up without a family. The problem is not only that he has sacrificed the potential of a normal life—the point of the opening scene involving a meet-cute with Iris’ parents—but he’s also sacrificed his own conscience by stepping up and making the tough decisions. The military cause is paralleled with Team Machine’s cause throughout the episode’s flashbacks, where Paul explains that people’s true intentions are always under question in a war-torn country like Afghanistan. Trying to make a case for himself, Paul insists that he’s a true soldier and different than the corrupt police, whose intentions shift from good to evil based on where the money can be found. Reese accuses Paul of doing the same, but he insists that he’s different. He’s a good soldier because he believes in what he’s doing, a sentiment echoed by Team Machine. The idea of trying to fight an impossible fight because of loyalty to a cause connects Paul’s experience of occupying this foreign territory with Team Machine’s experience trying to battle a seemingly invincible opponent like Samaritan. Again, the takeaway is that soldiers like Team Machine do what needs to be done because helping people is a pure good in life whose merit cannot be questioned, regardless of the occasional negative fallout. Meanwhile, the Machine spits out a poem about change and Root interprets that as a sign that she should install it with the Samaritan malware that she and Finch loot from a rerouted delivery truck. The purpose of the malware is to connect to Samaritan but Root has isolated it; the malware then begins to replicate itself within the Machine. Finch questions Root’s characteristic impulsivity and she insists that taking risks is the only choice at this juncture. 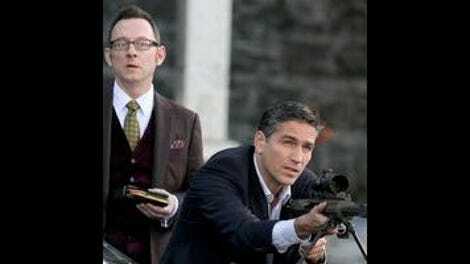 These may not have been the riskiest episodes of Person Of Interest, but they successfully furthered the plotting established in the premiere and expanded on the show’s favorite themes. Not too shabby. I don’t have the space to post stray observations today so it’d be great if you’d post your favorite quotes and moments from these two episodes in the comment section below (like you weren’t going to do that anyways). I apologize for the tardiness of this posting. I misunderstood this week’s airing schedule but single episode reviews will resume next week. Thanks for your patience!